Back in 2010, I reviewed version 3 of Smile’s TextExpander. The company recently updated its venerable text-expansion utility to version 4 ($35; $15 for owners of older versions), and though the latest version will be quite familiar to anyone who has used earlier iterations, Smile has added some notable new features. For the uninitiated, TextExpander lets you create abbreviations for bits of text that you frequently type—the program calls these bits snippets. You type an abbreviation in any document or text field, and TextExpander instantly replaces the abbreviation with the corresponding snippet. For example, I’ve created simple snippets for my name (kmc), my address (ad1), and my telephone numbers (ttel and tmob). I also have a number of more-complex snippets that I use when writing in HTML that take advantage of special TextExpander features. For example, hrf types an <a href></a>-tagged link and inserts the contents of the clipboard as the URL. The program also automates the tasks of filling out online forms, inserting email signatures, and even correcting typos (instantly replacing teh with the, for example). Suffice it to say that these snippets are so useful, and so ingrained in my workflow, that I could scarcely work without them. You don’t need to remember all of your snippet abbreviations, as TextExpander’s systemwide menu provides quick access to your snippets. You just choose one from the menu to paste it immediately. This menu is especially useful for snippets for things such as HTML and CCS—TextExpander lets you create an entire library of snippets for this type of coding. Creating a snippet group within TextExpander puts that group in a separate submenu in the TextExpander menu for more-precise organization and easier access. Smile provides a number of useful snippet libraries, but it’s easy to create your own snippets, too. Commands to Create Snippet From Clipboard and Create Snippet From Selection bring up a small pop-up window for quickly creating new snippets from the clipboard or from text that you’ve selected in the frontmost app, respectively. I use these commands frequently when I’m working on a new project and I know that I’ll be typing certain words or phrases frequently. The full TextExpander window lets you create complex snippets that contain variables such as the date and time; that insert text from the clipboard; that position the cursor in a specific location in the pasted snippet; and that “type” special keys such as Enter, Return, or Tab within the snippet. For example, if you must frequently fill out a particular online form, you can create a snippet that includes the necessary Tab commands to advance through the form’s fields. If you use TextExpander on multiple Macs, you can use Dropbox to synchronize your snippets across those Macs, as well as with your iOS devices if you use the iOS version of TextExpander, which supports dozens of iOS apps. The most significant new features in TextExpander 4 are additional options for “fill-ins,” which are complex snippets offering fields that you can fill in on the fly, or which can contain multiple choices. For example, you can create a form-letter snippet that prompts you to fill in fields with the name of the recipient, as well as specific information that varies from letter to letter (such as a price, date, or product name). You can even use pop-up menus to choose from a list of values. This is a much more powerful feature than can be explained in a paragraph—and though fill-in snippets can require some work to create, they can save a huge amount of time if you often type or paste this kind of text. Another improvement in TextExpander 4 is that I didn’t encounter any of the performance shortcomings I noted in my review of version 3. Version 4 is officially compatible with OS X 10.8 Mountain Lion, too, and the company has added a number of other minor features and tweaks. 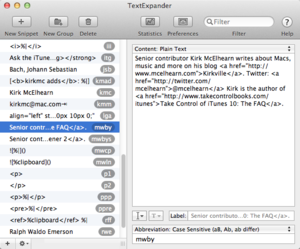 The aforementioned features aside, TextExpander 4 is quite similar to version 3. If you’re running OS X 10.7 Lion or earlier and don’t need the new fill-in features, you may not see much benefit from upgrading. 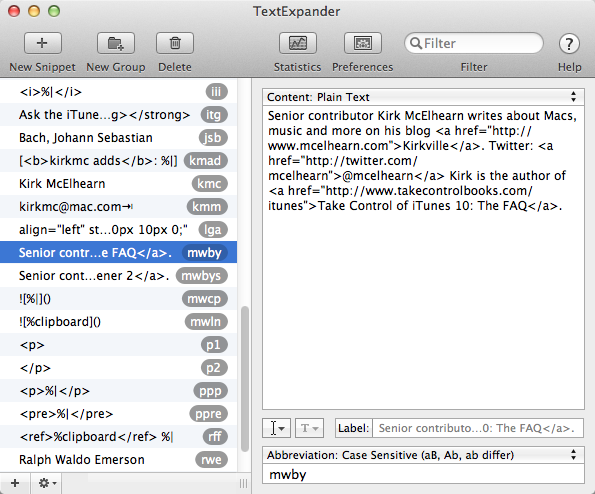 But if you’re a heavy TextExpander user—and especially if you use fill-ins—it’s a nice improvement for $15. And if you’ve never used TextExpander or a similar text-expansion utility, you might want to check out TextExpander to see how much time it can save you.